Whether your child experiences a sprain, broken bone or complex musculoskeletal condition, you'll find excellent orthopedic care at UNM Health System. Trust us for services that make physical activity as safe and easy as possible for your loved one. The care team also may recommend rehabilitation services to help your child experience the fullest possible recovery. 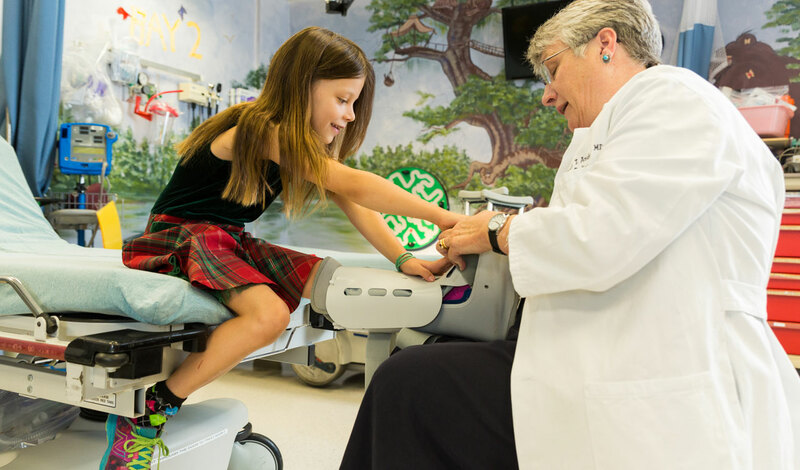 If your child's doctor recommends a DEXA (bone density) scan, you'll appreciate the child-friendly environment and pediatric technicians at the UNM Carrie Tingley Bone Health Center. When appropriate, take advantage of the lateral distal femur DEXA test, which scans the thighbone quickly and comfortably. No matter what area of the body the test evaluates, trust us to make a diagnosis based on pediatric, not adult, standards of bone density. Experiences more than two fractures. Takes steroid medications or medications for seizures or acid reflux. Is diagnosed with kidney failure or a rheumatological condition. To schedule an outreach clinic appointment, call 1-800-472-3235. Ask your pediatrician for a referral before you call.